The Bosch Tile Laser Square Laser Level features 2 lasers that can project up to 30 ft. to ensure sufficient space for markings. Integrated vials provide additional accuracy when attempting to achieve level surfaces. Batteries are included to let you get working right away. Projects a horizontal and vertical laser chalk line on any surface up to 30 ft. The Bosch GOL 26CK automatic optical level kit features a self-levelling compensator, both horizontal/vertical cross hairs and Stadia lines, 26x magnification lens and large aperture for clear image. Range: 330 ft., accuracy: up to 1/16 In. @ 100 ft., includes: hard case, lens cap, plumb bob, adjustment tools, aluminum tripod, aluminum levelling rod. 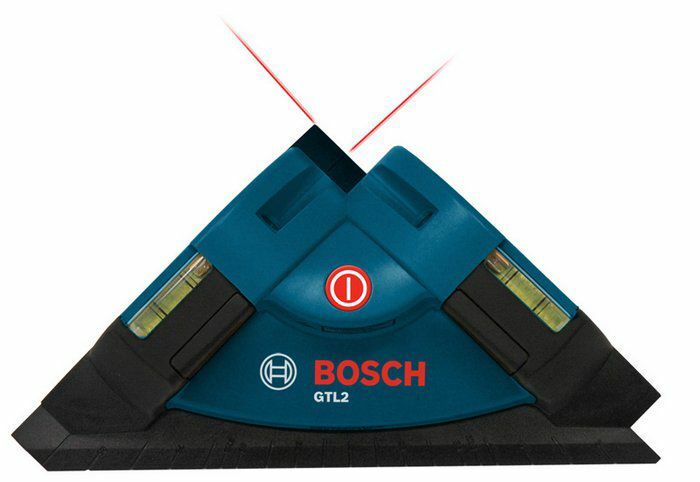 Tile Laser Square Laser Level The Bosch Tile Laser Square Laser Level features 2 lasers that can project up to 30 ft. to ensure sufficient space for markings. Integrated vials provide additional accuracy when attempting to achieve level surfaces. Batteries are included to let you get working right away. Tile Laser Square Laser Level is rated 4.2 out of 5 by 83. Rated 1 out of 5 by HomeDepotCustomer from Would not project line more than ten feet. ... Would not project line more than ten feet. Rated 4 out of 5 by gscaleut from We bought it to give straight lines on the floor to lay tile on - works great for that since you ... We bought it to give straight lines on the floor to lay tile on - works great for that since you cover chalk lines with thin-set when you lay it down. Rated 5 out of 5 by 6969rabbit from it worked great. it worked great. Rated 5 out of 5 by Morris from Nice laser level I haven’t used it, but seems very... Nice laser level I haven’t used it, but seems very light weight and the laser is very bright which is good. Rated 5 out of 5 by Docs from Does a nice job and is extremely handy when tiling alone. Does a nice job and is extremely handy when tiling alone. Rated 3 out of 5 by Ru from Not bright enough. Not bright enough. Rated 5 out of 5 by Tracy from I could have used this tool years ago. ... I could have used this tool years ago. Quickly I laid out a basement studio (walls, closet and a bath) by getting parallel and 90 degree angles off a desired wall. I will be using it to lay out tile next. The red laser is usable for many feet in two directions. Can’t speak to longevity yet. Rated 5 out of 5 by DK from The square is ready out of the box. Works... The square is ready out of the box. Works well as a right angle for laying out tile or other types of flooring.